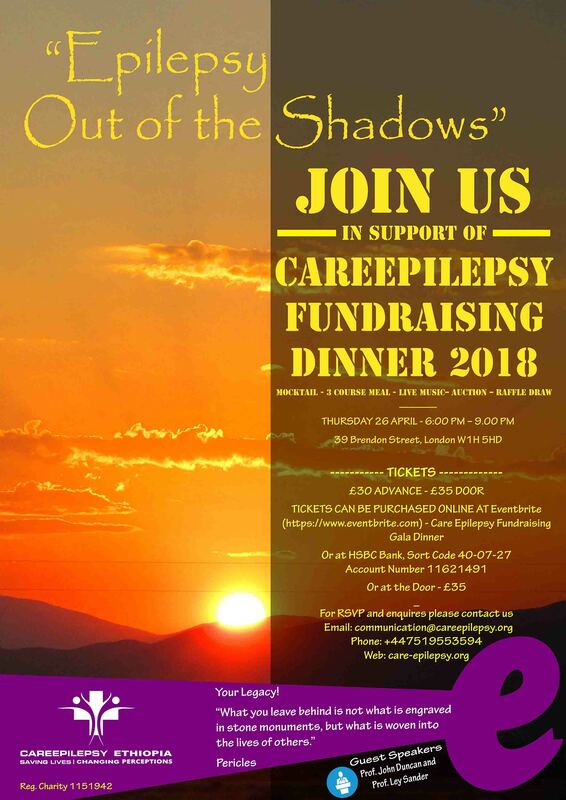 The CareEpilepsy team invites you, your family and friends to attend our Fundraising Dinner on Thursday, 26th April 2018. The theme of our event is “Epilepsy Out of the Shadows” which is the motto of our Ethiopian Youth Campaign against Epilepsy. By attending the event, you will learn more about the plight of people with epilepsy in Ethiopia and see the impact of our work so far. The aims of this fundraising event are twofold: to raise awareness of CareEpilepsy’s work in Ethiopia and to raise funds to increase our impact. We would love to see you on this special evening to have fun and exchange ideas on how we can work together to improve the lives of people with Epilepsy in Ethiopia. Where To Purchase Your Ticket: You can purchase your ticket by depositing directly into CareEpilepsy’s Bank Account at HSBC Bank, Sort Code 40-07-27 Account Number 11621491. You can also pay online on Eventbrite. Please bring your ticket with you to show at the entrance. How To Get Here: By Underground: The venue is a walking distance from Edgware Road and Marble Arch “tube” stations, as well as Paddington Train Station. To get directions to the Advent Centre from places in London using Bus, Tube, National Rail, please refer to the “Transport for London” website (www.tfl.gov.uk) our building’s postcode is W1H 5HD. By Car: There is limited “pay by meter” parking around our building approximately £5-7 per hour). Parking garages with varying charges are also available in the area. Who To Contact For More Information: Contact Sherard Wilson at sherard@familywilson.net for more information.